Less than a week ago, Carrier was persuaded by President-elect Donald Trump to keep about 1,000 jobs in Indiana. Now, the air conditioner and furnace manufacturer is raising its prices. United Technologies Corp., Carrier's parent company, is raising prices for its heating, ventilation, and air conditioning equipment by up to 5%, starting January 1. The decision to raise prices was first announced on November 23, the week before the Trump deal was finalized. Until last week, the manufacturer had planned to move 2,100 jobs to Mexico to cut costs. The move would have saved United Technologies an estimated $65 million a year. 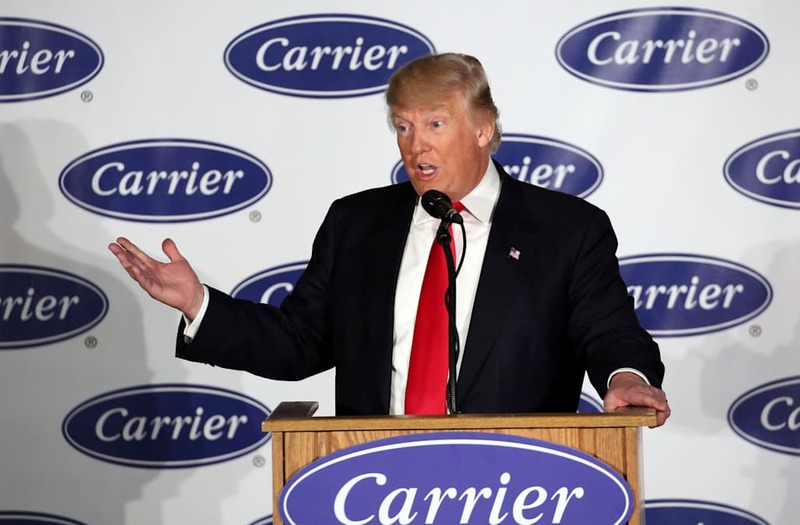 Last Tuesday, Carrier announced it would keep about 1,000 jobs in the US after negotiations with Trump and Vice President-elect Mike Pence, who is currently the governor of Indiana. The deal awarded Carrier $7 million in state tax breaks over 10 years. The manufacturer said its decision to raise prices was unrelated to the Carrier's decision to keep some jobs in Indianapolis. Trump's deal with Carrier does little to address the broader issues that make it tough for manufacturers to keep jobs in the US. "This agreement in no way diminishes our belief in the benefits of free trade and that the forces of globalization will continue to require solutions for the long-term competitiveness of the US and of American workers moving forward," Carrier said in a statement released last Wednesday. Trump has said that he plans to cut corporate taxes and regulation that makes doing business in the US more expensive. He has also threatened to heavily tax companies that outsource manufacturing overseas. Critics say these strategies could result in higher prices for items that were previously imported. "Pres-Elect Trump means well," Ben Sasse, a Republican senator from Nebraska, tweeted on Sunday. "But won't his 35% tariff idea raise prices on American families? How would it not be a new 35% tax on families?" Pres-Elect Trump means well. But won't his 35% tariff idea raise prices on American families? How would it not be a new 35% tax on families?